Congestion at locations popular with tourists and travellers is also something commonly faced in the summer months. This can be an inconvenience, but it is also a risk if your stress levels rise to the point that your driving changes, e.g., you start driving more aggressively out of frustration, or faster to make up for lost time. Hot weather increases the pressure in your tires, which can result in blowouts on tires that are damaged or worn. There is usually more road work being done during the summer months than other times of the year. This can cause disruption to your journey, particularly when travelling to an area you are not familiar with. Long car journeys in hot weather can lead to dehydration. It is therefore important to keep a bottle of water with you at all times. You will encounter more motorcycles and bikes on the road in the summer than in the winter. This requires greater attention and awareness from all road users, as people on two wheels are harder to spot. You don’t often associate summer driving with slippery roads, but in certain conditions, it does happen. When there has been a period of dry weather that has allowed grime and dust to build up on the road surface, when it rains, the road surface can become slippery for a period of time. Monotony is common for families going on trips during the summer, especially when traveling with youngsters. The answer is to have plenty of in-car activities for children to do, and to make frequent stops to break up the journey. Allergies like hay fever can strike at any time, including when you are driving, even in modern cars with pollen filters. Not only can this make journeys uncomfortable, but hay fever can also increase your risk of having an accident. It can do this in a number of ways, including when you sneeze or when your eyes are watery. The distraction of having hay fever can also reduce your concentration as you focus more on the allergy and less on the road. It is almost as easy to get sunburned in a car as outside it, particularly if you have windows with a normal transparency level. The part of your body most at risk is the arm closest to the window, but it can affect other parts, depending on the strength of the sun and the time of day. The summer is the time of year when you are more likely to go to the beach or other type of day trip. What happens with your car key or remote on these occasions? What do you do with it when you go into the water? It is easy to damage or lose your car key/remote in these sorts of situations. You may not encounter all of these challenges and hazards, but you will have to deal with some of them. 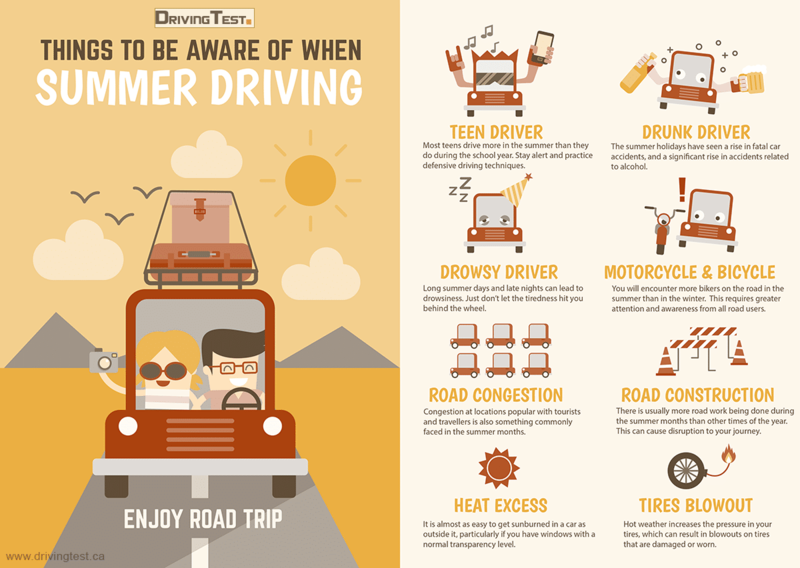 Being aware of them is the first stage to ensuring they don’t interfere with your summer driving enjoyment.